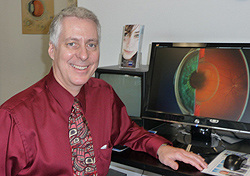 Dr. Van Kirk is a graduate of The Ohio State University College of Optometry and has been in practice for 33 years. He also has a Bachelor of Arts degree from the University of Hawaii. It is Dr. Van Kirk's goal to be your vision care professional for the next 20 years. Our use of cutting-edge technology provides you with custom products designed for all your visual needs.